Government officials are reportedly weighing converting preferred shares in Citigroup into common stock, which ultimately bolster the embattled bank's capital structure. NEW YORK (CNNMoney.com) -- Citigroup Inc. is in discussions with regulators about a plan for the federal government to take a larger ownership stake in the bank, according to published reports. According to the Journal, the talks involve Citi executives and regulators at the Federal Reserve and Office of the Comptroller of the Currency. Officials in the Obama administration have not said whether they support the plan, the Journal reported. Citigroup spokesman Michael Hanretta declined to comment on the Journal report. On Friday, the bank issued a statement saying that its capital base is "very strong" and capital reserves were among the highest in the industry at the end of the fourth quarter. "We continue to focus and make progress on reducing the assets on our balance sheet, reducing expenses and streamlining our business for future profitable growth," Hanretta said. Yet the department noted that it was open to allowing financial institutions to covert government's existing preferred shares into new convertible preferred stock - a move that would ultimately allow Citigroup to strengthen its capital levels. "We've made clear that we will do what is necessary to strengthen and stabilize the financial system so that it can provide the credit necessary to support economic recovery," Treasury spokesman Isaac Baker said in a statement to CNN. The report is sure to stoke speculation about whether the Obama administration may have to nationalize large banks to stabilize the financial system. The question of nationalization has weighed on the minds of investors in the two weeks since Treasury Secretary Tim Geithner announced a comprehensive stability plan that fell flat. The issue came to a head Friday when nationalization fears helped drag down shares of Citi (C, Fortune 500) and Bank of America (BAC, Fortune 500) as much as 36% at one point. BofA recovered most of its losses to finish down just 3.6%. But Citi's stock closed with a 22% loss. Citi shares were trading nearly 10% higher early Monday afternoon. The Obama administration has said it wants to keep the banking system in private hands, which seems to suggest it isn't aiming to run the likes of Citi and BofA. But that leaves the door open to an "intervention" -- a takeover of a troubled bank for the purpose of breaking it up, bringing in new capital and finding new owners and management. The term nationalization has been used to cover a range of very different outcomes. Most obviously, it refers to the outright takeover of troubled firms, such as when the Treasury Department put mortgage giants Fannie Mae (FNM, Fortune 500) and Freddie Mac (FRE, Fortune 500) into conservatorship. But it has also been used by some people to cover sizable investments that give government officials considerable say in a firm's activities -- such as the loan guarantees extended in recent months to Citi and BofA. 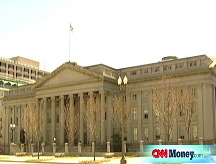 -CNN's Alona Rivord contributed to this report.